Even though Yelena Valbe was unquestionably one of the greatest cross-country skiers of the 1990s, winning nearly everything during a sparkling 10 year career, an individual Olympic gold medal always eluded her. Her total of 23 championship medals places her alongside the very best in her sport. She hit top gear at the 1997 world championships when she swept the board, winning all five events. Growing up in the Siberian city of Magadan, one of the coldest parts of the Soviet Union where temperatures slide as low as minus 30 degrees celcius, she was coached in her early years by Gennady Popkov. The harsh conditions were to develop her into a tough campaigner and in 1984, when only 16, she confirmed her early potential by winning her first national title. She won the 10km and 30km races at her first attempt at a major competition, the 1989 world championships. Success after success followed, and by the time she retired she had accumulated 45 world cup victories to sit alongside her seven Olympic medals. A member of the Unified Team that competed at the 1992 Albertville Games, she stumbled somewhat on the Olympic stage, winning four individual bronze medals at 5km, 10km, 15km, and 30km but going no further. 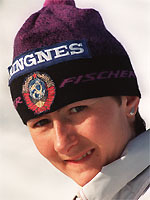 Despite that setback, her luck at relay events was considerably better and the gold medal hung around her neck at three consecutive Games, from Albertville to Nagano in 1998, the second and third wins coming as part of the Russian team. World Cup champion on five occasions and either second or third on four others, her dominance on the circuit was unrivalled and she retired in 1999 to spend more time with her young son Franz.